Isometric exercises can raise muscle metabolism and burn fat. Isometrics involve exercises in which you contract specific muscles without moving your joints or limbs. The force of the contraction strengthens the muscle but doesn’t affect the muscle’s length. The exercise mimics a push or a pull. For example, pushing a fixed object, such as a wall, or holding a weight, such as a dumbbell, in a stationary pose can be an isometric exercise. Isometric exercises can dramatically increase the tension in your muscles. By achieving maximum contraction in an exercise, you can boost muscle and bone mass. A single daily isometric exercise will not impact your muscles. A training program of daily repeated movements will lead to stronger muscles. Since weight machines or free weights are not required for isometrics, it’s a convenient form of training. Each isometric exercise requires an average of three to eight seconds in which you hold a muscle or joint in a set position. 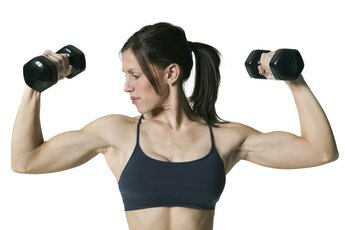 To noticeably increase muscle power, repeat each exercise between five and 10 times per session and perform them over six to eight weeks, according to Lee Brown’s 2006 "Strength Training." Isometric exercises are primarily used in the early stages of physical therapy or rehabilitation. They are effective in orthopedic applications that require patients to pinpoint, isolate and strengthen muscles. The main advantage is the ability to localize an exercise without involving any joint movement. If a patient has an immobilized limb, he can perform isometric exercises to counteract muscular atrophy. A patient will typically see strength gains at the specific angle of the muscle’s contraction. Some strengthening will also occur in any surrounding joints. While dynamic exercises -- which involve the movement of muscles and joints -- commonly target large muscle groups, isometrics help you to isolate small muscles. Some activities require the strengthening of small muscles, such as those in your palm and fingers. Two types of isometric exercises exist -- maximal and submaximal -- which relate to the amount of power used in the exercise. In maximal isometrics, you employ as much force as you can muster to push against a stationary object. Submaximal isometrics involves holding an object in a particular position. For example, the sport of pistol shooting demands that you grip the pistol with maximum control to achieve the perfect shot. You can use submaximal isometrics to condition the muscles in your shooting as well as non-shooting hand. An isometric exercise is not only specific to a particular muscle but also static. Only the contracted muscle is strengthened. To strengthen the entire range of a limb’s movement, you’d have to do a separate contraction for each muscle engaged in the movement. By focusing on one muscle, you may not train the body evenly. Isometrics do not involve the pumping of blood through the muscle and can lead to diminished speed and endurance, according to Bill Pearl’s 2001 “Getting Stronger: Weight Training for Men and Women.” These static exercises can also raise blood pressure. People with heart problems or high blood pressure should avoid isometrics. Essentials of Exercise Physiology, 3rd Edition; William D. McArdle, et al. Science and Practice of Strength Training; Vladimir Mihajlovič Zaciorskij, et. al.